Leading luminaries of the corporate world--Reliance Industries Chairman & MD Mukesh Ambani, Mahindra Group Executive Chairman Anand Mahindra, Godrej Group Chairman Adi Godrej, HDFC Ltd Chairman Deepak Parekh and Paytm Founder and CEO Vijay Shekhar Sharma--are all set to shine bright at the India Today Conclave this year. The industry titans will fuel new ways of thinking by touching upon relevant topics during the panel discussion spread over two days. On the first day of the event, India Inc will discuss issues ranging from the problem of private investment to the e-economy to the possibilities of making India more attractive as an investment destination. The second day will see a keynote address by Mukesh Ambani who will be speaking on ‘Why Technology Will Change India’ as a ‘21st Century Optimist’. 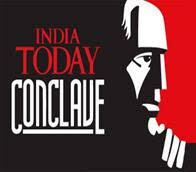 India Today Conclave is a unique platform where the sharpest minds from across the globe converge at a forum to discuss and debate issues from around the world. Taking a break from previous years, the India Today Group's signature event will be held in Mumbai for the first time on March 17 and March 18. The Great Disruption, the theme of the India Today Conclave this year, will feature ground-breaking ideas, innovative experiences and thought-provoking debates. There will be two days of talking, listening, thinking, doing and experiencing. From the President of India, Pranab Mukherjee, Prime Minister of India, Narendra Modi and former President of the French Republic (2007 -2012) Nicolas Sarkozy, to giants of the corporate world and stalwarts from Bollywood – the list of speakers this year is bigger and bolder, heralding a wave of change.